"Our image of God and our image of self are two sides of the same coin" said Dr. Hsin-hsin Huang, the leader and trainer for Spiritual Companions to retreatants who go through a 9-month experience of the Spiritual Exercises of St. Ignatius of Loyola. As we each shared our prayer and spiritual experiences, Dr. Huang continued to pepper our discussion with more spiritual insights on the path to spiritual maturity. Our image of God relates directly to how we view ourselves. Our first image of God often arises out of our relationship with our parents. Our early images of God can be rooted in several dynamics: fear of punishment, expectations of perfection or hyper-responsibility, an experience of abuse, absence or unreliability, and maybe even one of love and forgiveness. Just as our relationship with our parents changes over time to a more equal relationship between adults, so also can our relationship with God. We move from fear of God to love of God as we mature. If we fear God as a judgmental moralist who demands right behavior, then we see ourselves as an unlovable, bad person who has to do better. We consequently live with a lot of guilt and shame that leads not only to low self-esteem, but also to judgmental attitudes toward others. There are a lot of burned-out Christians today who can never behave exactly the right way for their demanding God, and others in society are also judged for missing the mark. The less we fear God, however, the more grateful we are to God for all God does for us in creation, in daily sustenance, in relationships, in talents and abilities, in forgiveness through Jesus. The less we fear God, the more we can love ourselves because God loves us. The more forgiving we believe God is, the more we are able to forgive ourselves and our own brokenness and imperfection. Such self-love, grounded in God's love, enables us to also love and forgive others, letting go of perfectionistic expectations. This is the hope of pursuing a spiritual path – that we mature from an belief about God to the felt experience of God loving us. There is a difference between intellectually understanding God and affectively experiencing God's intimate, powerful love for us. We see this most clearly in the story of Mary and Martha in Luke 10:38-42. Jesus invites Martha to move from doing to being – from doing for God to being loved by God in the presence and person of Jesus. I have always been a "Martha" – with a hyper sense of reasonability to and for the well-being of others. When I began the Spiritual Exercises of St. Ignatius of Loyola in the fall of 2013, the first prayer exercise was to "behold God beholding me and smiling." For the first 56 days, I did this exercise, but it was an intellectual exercise – I held a picture in my minds' eye. But on day 57, I felt a physical shift in my body from my mind to my gut – I felt loved. I was a little startled and said out loud to God, "you really do love me, don't you?!" And I smiled. (I had been ordained as a pastor for 24 years and had been serving a God with very high expectations of me). Dr. Huang offered another exercise to help us identify childhood images of God that affect our relationship with God today: write about each of one's parents, describing them in about a page. Take a break and come back 30 minutes later to notice what, if anything you have written about your parents describes your image of God. What brings you deeper in your relationship with God and of what can you let go that hinders you from experiencing how much God loves you? 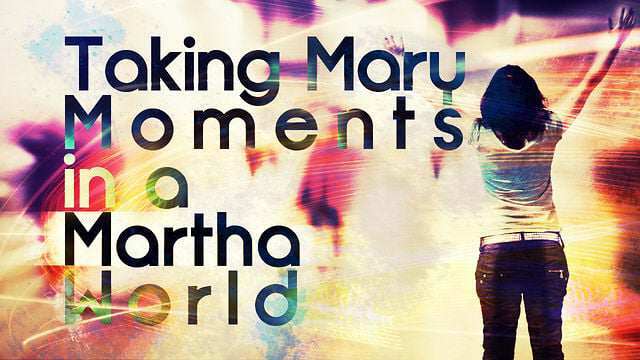 Then practice "beholding God beholding you and smiling - a Mary practice in a Martha world. Visit The Bridges Program to learn more about how you can experience the Spiritual Exercises!